Lightweight sturdy Spray Mop is ideal for cleaning LVT, hardwood, laminate and many other hard surface floors. The Hilway Direct Spray Mop comes almost completely assembled, just click together the handle for use, fill the removable liquid dispenser and press on the microfiber mop pad to begin cleaning. Spray trigger on the mop handle reduces bending and reaching when you clean the floor. 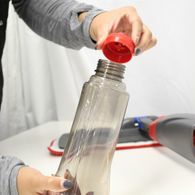 Remove the liquid dispenser bottle from mop handle and opens the bottle lid for easy filling with cleaning solution. The liquid dispenser holds 24 ounces of liquid. Hilway Direct Spray Mop is ideal for use with Hilway Direct Neutral Cleaner Concentrate diluted with water for cleaning the floors in your home. For routine cleaning with Hilway Direct Neutral Cleaner in the Hilway Direct Spray Mop, add 1.5 teaspoons of concentrate to 23 ounces of water in the liquid dispenser bottle. This will yield approximately 24-ounces of cleaning solution for cleaning your floor. Brands of concentrated floor cleaners, other than Hilway Direct, may have different dilution ratios so check product label prior to use in the Hilway Direct Spray Mop. Ready to use floor cleaning solutions are not intended to be diluted and can be poured directly into the spray mop's dispenser bottle for cleaning your floor. 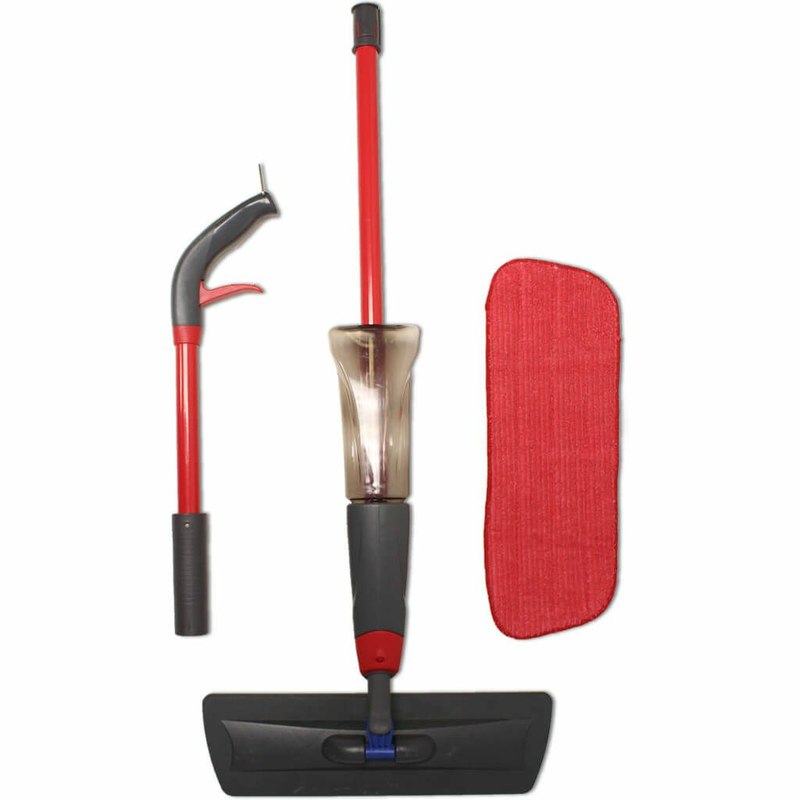 To assemble the Hilway Direct Spray Mop, fit the upper mop handle into the lower mop assembly and click it into place. The two parts of the mop connect with little effort and do not come apart once connected. 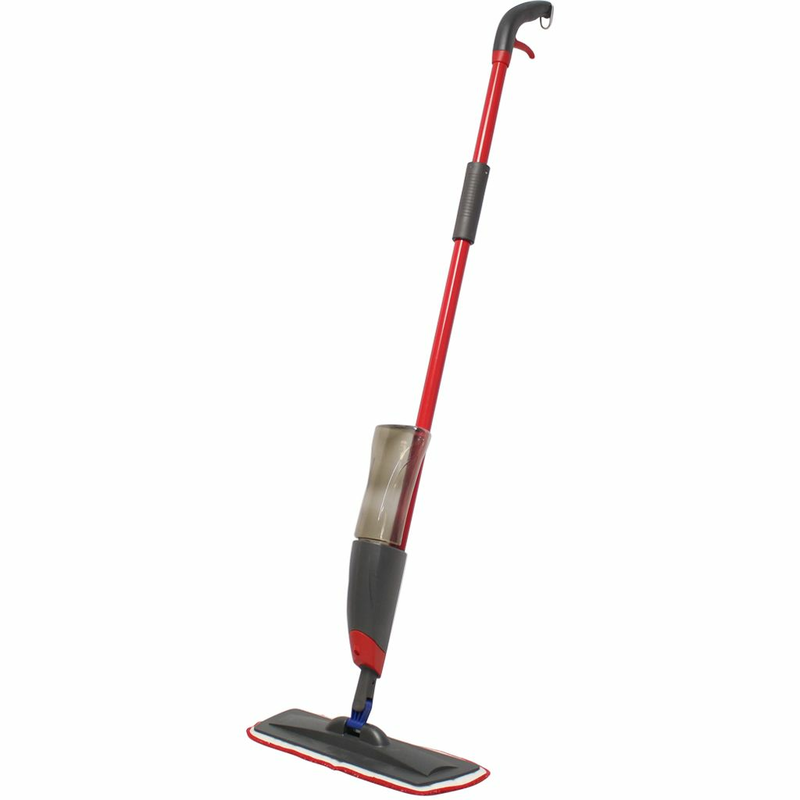 The mop base is a standard residential size and able to clean the floor in most tight spaces. 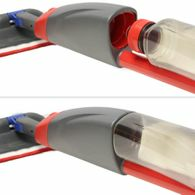 To use the fully assembled Hilway Direct Spray Mop, fill the liquid cleaner dispenser with the appropriate floor cleaner, by following dilution ratios indicated on the cleaner label, put the mop pad on the floor, color side down, and press the mop base onto the white backing of the microfiber mop pad. To start cleaning, pull the trigger on the spray mop handle to release cleaner onto the floor and wipe with the mop in a back and forth motion, mopping in the direction with the grain of the floor when applicable. Work in small sections. Do not saturate floor with cleaner, just mist. Do not allow cleaner to dry on floor before wiping. Each area will dry quickly after being cleaned. After each use, launder the microfiber mop pad. Machine washing recommended, no fabric softener. Allow mop pad to air dry. 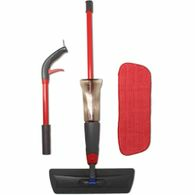 Store the Hilway Direct Spray Mop upright with liquid dispenser inserted into mop and the microfiber mop pad removed from the mop base. Liquid dispenser bottle has marking on the bottle for water and solution fill lines. These lines do not indicate dilution for Hilway Direct Neutral Cleaner and may not be accurate for other floor cleaning brands. When the dispenser bottle is filled to the top line, marked 'solution', this equals 24 fluid ounces of liquid. Floor cleaning solution is NOT included with the Hilway Direct Spray Mop, item HD-SM.